The launch of Apple’s Final Cut Pro X spawned a large ecosystem of plug-ins and utilities. This was due, in part, to the easy method of creating Motion templates, along with the need to augment interoperability with other applications, i.e. fill in the gaps in FCP X’s capabilities. Lately you have to wonder about the general status of the FCP X plug-in market. GenArts decided to discontinue its Sapphire Edge product and BorisFX only recently launched its BCC 9 version for FCP X*. GenArts may have simply stopped the Edge product because the business model wasn’t working. On the other hand, new offerings, such as Red Giant Universe, build up the available tools. NLEs suffered a “race to the bottom” with pricing, which left us with numerous low cost and even free options. Historically, plug-in packages have been tiered to the price of the host application. If you paid tens of thousands or more for a product like Flame, then paying a couple of grand for a set of third-party filters wasn’t unreasonable. The same filters for After Effects cost less, because the host was less. Naturally the market drives this, too, since there are far more After Effects users buying plug-ins, than there are Flame users. Unfortunately, that NLE “race to the bottom” leaves plug-in developers in an uncomfortable position, because many users are loathe to pay more for a set of plug-ins than for the host application itself. These shouldn’t be related, but they are. It’s also not an exclusive FCP X problem, per se. Autodesk’s introduction of Smoke on the Mac didn’t attract Sparks plug-in developers to adapt their Flame/Smoke plug-ins to the Mac platform. That’s because these new users simply weren’t going to pay the kind of prices that Flame users had and still do for Sparks filters. Since Autodesk had no “takers”, they ended up adding more of the filter building blocks into Smoke itself and in the Smoke 2015 product have dropped the Sparks API altogether. Aside from the issue of cost and what fuels development, for the user, plug-ins can be a tricky issue. Often plug-ins can be the biggest cause of application instability and poor playback performance. All too often, application crashes can be boiled down to a misbehaving filter. Most of the time, third-party effects do not provide as smooth of a performance as native filters. This is especially true of FCP X where built-in filters are far less of a drag on the system, then the others. Most likely due to the “secret sauce” Apple applies to its built-in effects and transitions. In the case of Final Cut Pro X, there actually is no plug-in structure. It uses Motion’s FxPlug3 architecture as Motion templates. This means that a video filter, transition, generator or title has to be developed for Motion and that, in turn, is published as a Motion template, which appears inside FCP X as an effect. Even if you didn’t buy Motion, FCP X is running its effects engine “under the hood” and that’s why third-party filters work. While this makes it easy for users to create their own plug-ins, using the building blocks provided natively in Motion, it also adds a burden for more advanced developers. BorisFX, for example, must go the extra mile to make its FCP X filters and transitions look and feel the same as they do in After Effects, FCP 7 and other hosts. On top of having a tool that simplifies the creation of cheap and free filters, FCP X also includes a nice set of native filters and transitions. This set is far more wide-ranging than what’s currently bundled with Adobe Premiere Pro CC or Avid Media Composer. Of course, not all are great – the keyer, for instance, is mediocre at best – and there are missing items – no DVE, masking or tracking. That’s why there is still room for third-party developers to create tools that meet the needs of the more demanding customers. But, for the vast majority of FCP X users, there’s little or no need to purchase a comprehensive package of 200 effects, when a lot of these looks can be achieved within the FCP X or Motion toolkit already. The market does seem good for many specific filters that fill certain needs. I would imagine (although I don’t know actual numbers), that users are more likely to buy a tool like CoreMelt’s SliceX or Red Giant’s Magic Bullet Looks, because they address a specific deficiency. Likewise, I think users are more likely to buy a tool that works across several platforms. For instance, FxFactory Pro (and many of the FxFactory partner plug-ins) work for FCP X, FCP 7, Premiere Pro and After Effects on the same machine, without having to buy a different version for each host. Another development need is for tools that augment interoperability and workflows. People tend to lump these into the plug-in discussion, although they really aren’t plug-ins. 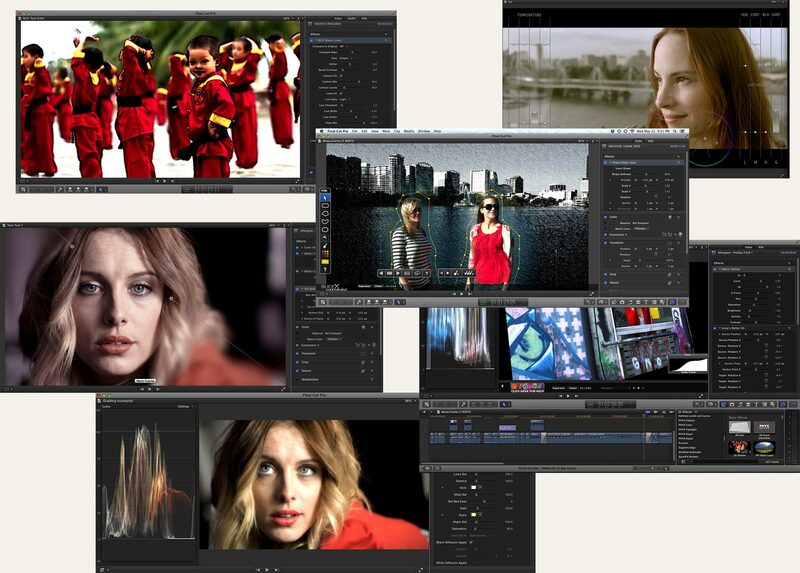 Tools like Xto7, 7toX, EDL-X, Shot Notes X and others are there to fill in the gaps of FCP X-centric workflows. If you have the need to send your sound from FCP X to a Pro Tools mixer, there’s no way to do it in X, using any method that’s commonly accepted within the industry. (I’m sorry, but exporting “baked in” roles is a workaround, not a solution.) The answer is X2Pro Audio Convert, which will generate an AAF with embedded audio from the FCPXML export of your timeline. The trend I do see in the FCP X world is the creation of more and more Motion templates that are, in fact, design templates and not plug-ins. This is probably what Apple really had in mind in the first place. Companies like MotionVFX, Ripple Training, SugarFX and others are creating design templates, which are mini-Motion projects right inside your FCP X timeline. It’s a lot like buying a template After Effects project and then using that via Dynamic Link inside Premiere. Such templates are cheap and fun and save you a lot of building time, but they do suffer from the “flavor of the month” syndrome. A design might be good for one single production, but then you’ll never use it again. However, these templates are cheap enough that you can charge them off to the client without concern. In kicking this idea around with friends that are developers, some felt there was a place for an Apple-curated market of plug-ins for FCP X – like the App Store, but simply for plug-ins, filters and utilities. That’s a little of how FxFactory works, but not all developers are represented there, of course. I do see the need for a product that acts like a template manager. This would let you enable or disable plug-ins and design templates as needed. If you’ve purchased a ton of third-party items, these quickly clutter up the FCP X palettes. Currently you have to remove items manually, by dragging the effects, titles and generators out of your Movies > Motion Templates folders. If you have FxFactory filters, then you can use the FxFactory application to manage those. Overall, I see the FCP X ecosystem as healthy and growing, although with a shift of users away from comprehensive effect packages – largely due to cost. Tools and effects that users do purchase seem to be more task-specific and, in those cases, money is less of a factor. If you are a film editor, you have different needs than a corporate producer and so are more likely to buy some custom tools that you cannot otherwise live without. These tend to be made by small, responsive developers that don’t need to survive on the revenue that the large bundled effects packages used to bring. It’s too early to predict whether or not that’s a good thing for the market. * Note: I originally composed this post a few weeks ago prior to the release of BCC9 and published this post with the error that BCC9 wasn’t out yet. In fact it is, hence the correction above. This entry was posted in Final Cut Pro X and tagged Effects, FCP-X.